My husband doesn’t care for most fish, so I rarely prepare it. On nights he works late I take advantage and make myself a fish dinner. Today I bought a scaled and deboned rainbow trout. I removed the head and cut away the side and back fins, rinsed it in cold water, patted it dry and laid it flat on a lined sheet tray. To keep it moist in the broiler, I brushed a little melted butter over the flesh and seasoned it with kosher salt and ground pepper. While the fish cooked, I added a little minced shallot and garlic to melted butter and let it sweat for a minute or so. 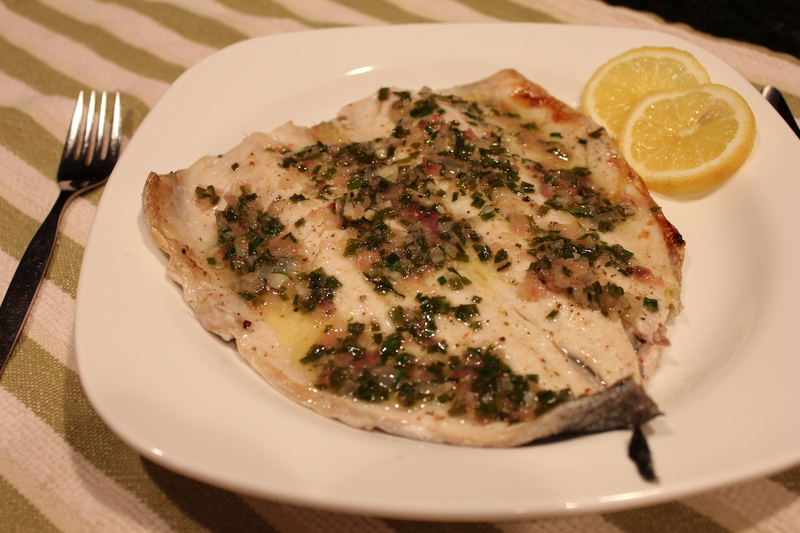 A squeeze of fresh lemon juice, some chopped chives and a dash of salt and pepper finished the sauce just as the trout came out of the oven. I really enjoyed it and the quick cooking time, about 3 minutes, kept the dreaded fish smell to a minimum, so as not to offend the sensitive husband when he got home! See the post on how to select fresh fish. Preheat the broiler and line a half-sheet tray (13 inches by 18 inches) with foil or parchment paper. Rinse the trout and pat dry. Lay skin-side down on the prepared tray. Brush each trout with butter and season with salt and pepper. Pop the trout in the oven and broil for about 3-4 minutes. Trout should be flaky, but now dry or brown. While the trout cooks, melt the butter in a small saucepan, sweat the shallots and garlic for a minute. Stir in the lemon juice and chives. Pour a little lemon sauce over each trout and serve immediately.